According to the latest CTHR Salary and Employment Trends Survey – 1H 2015, about 40% of employers have hiring plans, with the average increase in headcount at 8.6%. Marketing is the industry with the strongest hiring intentions. 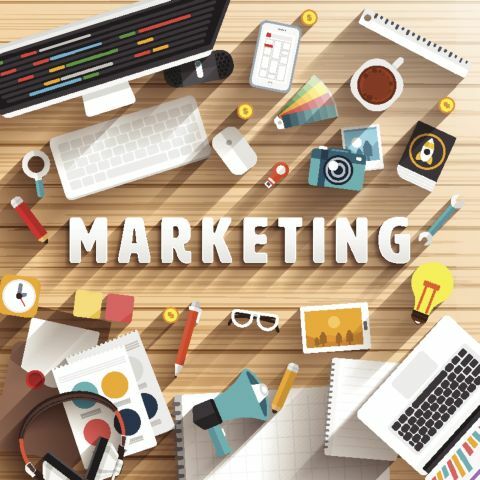 To continue last week's topic on the six major trends in marketing, in this issue, we will look further into the career paths and salary packages of marketers at different job levels. As the global big data trend will continue to drive up the talent demand of skilful digital marketers, the monthly salary median for digital professionals is among the highest in the marketing landscape. 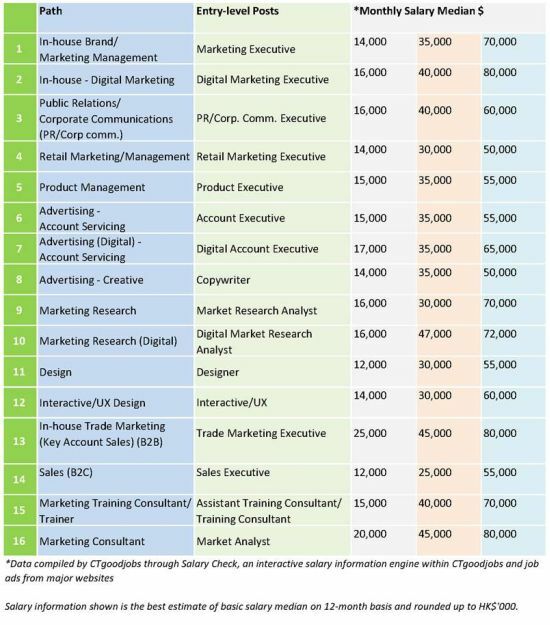 According to CTgoodjobs' analysis, marketing executives specialising in in-house brand/marketing management earn a median monthly salary of $14,000 at entry level; $35,000 at mid level and $70,000 at senior level. Average monthly salaries for digital marketing executives are slightly higher, at $16,000, $40,000 and $80,000 for entry level, mid level and senior level respectively. Below are more median salary numbers in different marketing areas collected from SalaryCheck, the salary search engine of CTgoodjobs. 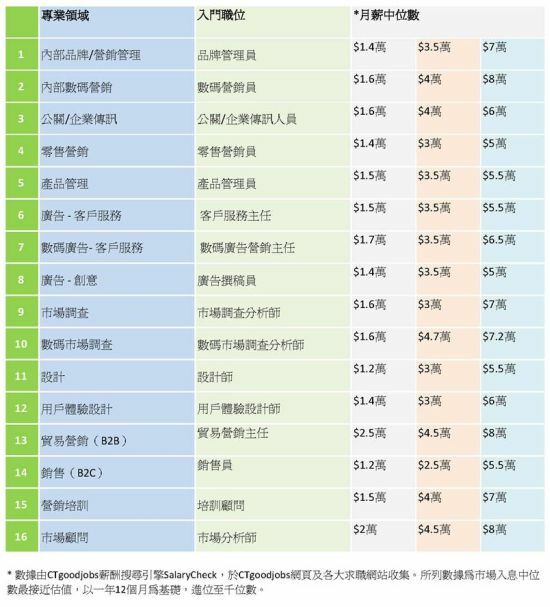 As shown in above table, digital experts at advertising agencies get the highest monthly salary rate at about $17,000 (entry level), $35,000 (mid level) and $65,000 (senior level). Meanwhile, the lowest rate goes to creative, receiving only $14,000, $35,000 and $50,000 for entry level, mid level and senior level respectively. In the next issue, we will share the three key concepts of becoming a real expert — the whole-brain marketer. Stay tuned!